If you find yourself in a court case against a narcissist, be prepared for the battle of your life. The narcissist wants to win, by any underhanded means available. Remember that these people are pathological liars and can put on an Oscar winning performance in the courtroom. The narcissist will be one of the most venomous, dangerous opponents one can face in any court of law. Criminal proceedings where you are the victim of a crime committed by the narcissist. Divorce proceedings, where property/money are in issue. Proceedings involving the return of property/money owed. If the case is one of divorce, the narcissist will present himself or herself as confident and calm, whereas the downtrodden ex-partner will have been run into the ground by this ruthless individual in the months and years leading up to the court case, and often will come across as stressed and lacking confidence. Do not engage in conversation and avoid any eye contact with the narcissist in or outside the court. If there is somewhere private to sit outside the court, find it, so that the narcissist and any of their enablers are not able to intimidate or unnerve you. Many people facing a narcissist in court worry that the narcissist will manipulate the court and their lies will be believed. It is vital to ensure that your chosen legal representative is up to speed on NPD. A lawyer who is not knowledgeable is likely to be manipulated by the narcissist and may advise you to settle when it is not in your best interests to do so. The narcissist has pushed you to your limits in the past. Now it’s your turn. Narcissists are likely to react with fury when caught out on their lies and bad behaviour and reveal information which they had no intention of revealing. Their rage may become uncontrollable, with their lawyer doing all in their power to keep them cool, calm and collected (a rather difficult if not impossible task). The narcissist is likely to have hidden or diverted assets. 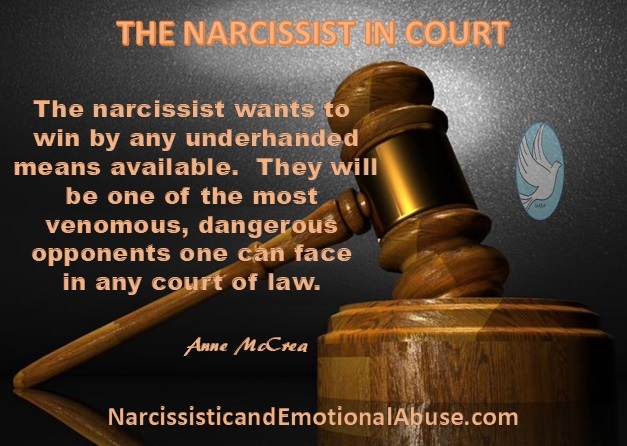 It is possible to break a narcissist in court, but one needs to be well prepared. It is critical that you are armed with irrefutable, undeniable and corroborated evidence. Avoid giving the narcissist any credible alternative scenarios to the facts. A well-versed lawyer can pose questions to the narcissist in such a way that will take the wind out of their sails ever so subtly. Contradicting or belittling the narcissist’s inflated view of themselves will shatter their fragile self-esteem. Whilst in the confines of the courtroom, position yourself away from the narcissist and never look in their direction. The fact that you are not looking at them will likely cause a narcissistic wound. The narcissist hates to be ignored. As we know, the narcissist believes they are above the law and not subject to the limitations of the everyday citizen. As far as they are concerned, they outrank anyone in the courtroom including the judge or magistrate. How dare anyone have the audacity to make them accountable for their actions! Anyone who gives evidence against them will be labelled a liar and corrupt. Never show any reaction to their words or behaviour. They knew how to push your buttons before and they will try it again. Make sure that these attempts are met with indifference. It can be difficult to relay to the court just how unacceptable the narcissist’s behaviour can be. Hopefully, they will supply that information to the court and discredit themselves when their fury erupts in the courtroom. Always tell the truth. Never be tempted to embellish the truth or paint a false picture. Don’t stoop to the narcissist’s level. This is so helpful, however, I don’t hAve a lawyer. I’m going through this now! We have a hearing today. This is helpful. The sad part is, most people are not trained on these manipulative, deceitful, and dangerous type of people with this disorder; therefore, they get away with ruining other people lives. Actually this is spot on. Not only was I prepared but he and his 2 nd attorney, for the first fired him, were over confident. They tried to manipulate and fabricate a false narrative. The judge wasn’t having any of it. When it came time for him to testify, because he refused to settle, his true self peeked out and the forensic accounting busted him on cheating. The judge shocked him with 1/2 my attorney fees, a healthy support, and he was to pay the bills he decided from which to run. He had his attorney’s fees, the mortgage , and taxes he must pay dating back to 2006. He never told me he wasn’t filing . He has since recently contacted me, with sugary words to try and compel me to sign joint tax returns. When I declined his lovely offer, his true self again tried to threaten me with litigation. My tax man has taken care of me and has me protected. They are wicked, but where they fail? Their egos and believing they are superior in intellect. If you find yourself in a battle with one , DO NOT MEDIATE. They will walk all over you and beat you down, get an atty. ! They have a fiduciary obligation to represent you to the fullest extent . I think it’s awful for anyone dealing with a narcissist on any level, which I have experienced so far in my personal life. I think it is insidious that sometimes those who take pleasure in using a broken system and use it as a means of revenge and to involve children and assets as a point scoring exercise of how “they” overcame an “abusive” person who didn’t tolerate their constant gaslighting, mood swings, subtle and random devaluation and anger when the intended victim did not play the willing victim. We need to be careful to examine who is the real victim and not make assumptions. This is especially true when you read responses that take glee in winning assets and child custody in spite of resistance and deriving pleasure from an exes financial or emotional distress.